David Manning was quoted as saying Heath Ledger was a "star"
A court action filed by film-goers against Sony Pictures may go ahead after the studio admitted using a fake critic to plug its films. Sony's lawyers had argued that adverts carrying quotes from fake critic David Manning about films such as A Knight's Tale were protected by free speech. But the Los Angeles trial judge rejected the claims. Justice Reuben Ortega said it was "the most frivolous case with which I have ever had to deal." A Sony executive allegedly created Mr Manning - a supposed film critic for real-life Connecticut newspaper, Ridgefield press - to plug several films including Vertical Limit, Animal and Hollow Man. 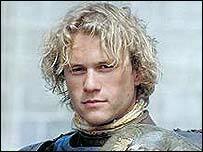 "Heath Ledger is this year's hottest new star," Mr Manning was quoted as saying about A Knight's Tale in 2000. He was also quoted as saying Hollow Man was "one hell of a scary ride" the same year. Newsweek magazine discovered Mr Manning was a fake in 2001. Sony Pictures stopped the adverts and suspended two of its advertising executives for their roles in the creation of Mr Manning. It also agreed last year to pay $325,000 (£230,000) in fines to the US state of Connecticut. Justice Ortega said that if the film-goers case succeeded, "from that day on all persons will be able to absolutely rely on the truth and accuracy of movie ads". He added: "No longer will people be seen lurching like mindless zombies toward the movie theatre, compelled by a puff piece. What a noble and overwhelming undertaking. The only losers will be those poor souls who do not go to the movies. "I cannot see breathing life into this farce."